The group’s website has a page devoted to its “Founder Members,” who include several well known international figures, including former U.S. Ambassador to the United Nations John Bolton, the rightist Catholic theologian George Weigel, former Peruvian President Alejandro Toledo, and former Czech Republic President Václav Havel. The group’s activities include publishing “working papers” and brief “dispatches and alerts” covering topics related to Israel. It also hosts events and promotes op-eds written by its members. Although FOII is headquartered in Madrid, Spain, the organization had over $1.5 million in total revenues in 2012 in the United States alone, according to its 2012 Form 990. 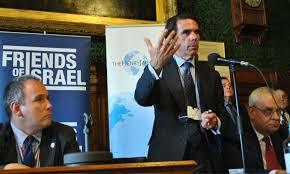 Josh Rogin, “Former Spanish Prime Minister José Maria Aznar launches pro-Israel initiative,” Foreign Policy, September 15, 2010,http://foreignpolicy.com/2010/09/15/former-spanish-prime-minister-jose-maria-aznar-launches-pro-israel-initiative/. Friends of Israel Initiative, “Welcome to our new site,” http://www.friendsofisraelinitiative.org/about-wellcome.php. Friend of Israel Initiative, “Founder Members,” http://www.friendsofisraelinitiative.org/about-advisors.php. Friends of Israel, “Welcome to Our New Website,” http://www.friendsofisraelinitiative.org/about-wellcome.php. Friends of Israel, “José María Aznar Promotes the Friends of Israel initiative,” http://www.friendsofisraelinitiative.org/event.php?pagina=2&c=31. Jose Maria Aznar, “Failed to Cut a Deal With Iran? Better Than Making a Bad One,” The Wall Street Journal, November 25, 2014,http://online.wsj.com/articles/jose-marina-aznar-failed-to-cut-a-deal-with-iran-better-than-making-a-bad-one-1416961109. Richard Kemp, Israel under Fire: The continuing threat of Iranian supported terrorist rocket attacks from Gaza, the failure of the international community, and the consequences of continued failure,” The Israel Project, April 30, 2014, http://www.friendsofisraelinitiative.org/uploads/papers/pdf/FOI_Paper20.pdf. Richard Kemp, “Understanding the Issue of Israeli Settlements and Borders,” Friends of Israel Initiative, July 2014,http://www.friendsofisraelinitiative.org/uploads/papers/pdf/FOI_Paper24.pdf.